WGU Tennessee, a nonprofit, online university that is part of Governor Bill Haslam’s Drive to 55 effort surprised a Chattanooga Charter School of Excellence (CCSE) teacher with a $10,000 scholarship Monday afternoon. 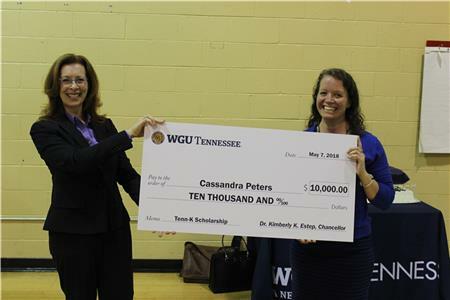 CCSE English teacher Cassandra Peters learned that she had won WGU Tennessee’s Tenn-K Scholarship during a special ceremony held at the school. 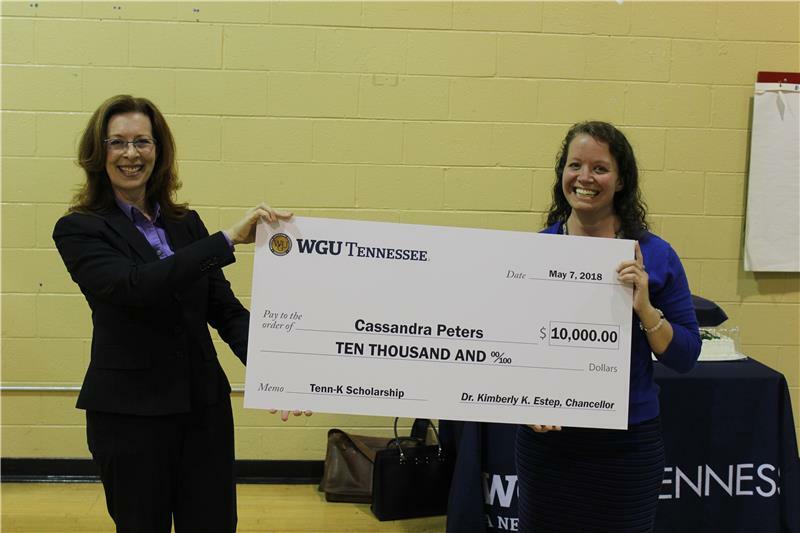 Peters was surprised with a commemorative check from WGU Tennessee Chancellor Kimberly K. Estep, Ph.D.
Ms. Peters is pursuing her master’s degree in English language learning. She hopes to use her degree to help a growing number of students who are new to the country and learning English as a second language. Ms. Peters is one of only seven Tennesseans to earn WGU Tennessee’s 2018 Tenn-K Scholarship this year, but is the second Chattanooga-area teacher to earn the scholarship as part of this year’s campaign. The scholarship – which covers more than 80 percent of WGU Tennessee’s already-low tuition of $3,500 per term for most programs – is awarded based on students’ academic records, readiness for online study, and demonstrated financial need.